Why do we cancel passports for terror suspects — and not just let them leave? 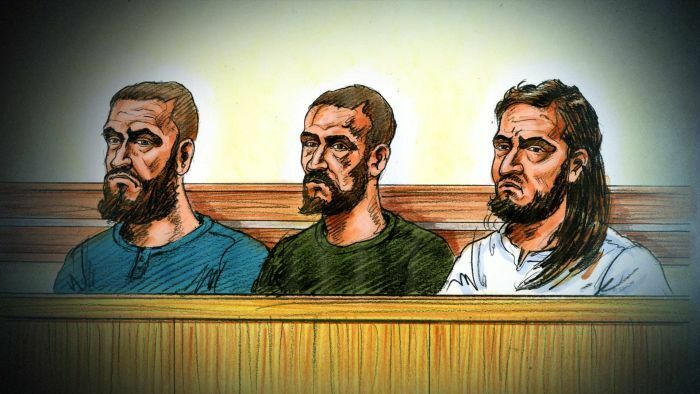 It has been revealed the trio charged with plotting a terrorist attack in Melbourne all had their passports previously cancelled. Two weeks ago we found out Bourke Street killer Hassan Khalif Shire Ali’s passport was cancelled in 2015. It’s prompted some to ask why, if we deem someone such a threat, do we cancel their passport? Why not just arrest them, or let them leave to fight and maybe die in a conflict overseas? Why do we cancel passports? The first and most simple reason is Australia has a legal obligation to do so. “If we know that somebody is going to go and commit a crime — particularly a violent crime, terrorism — in some other jurisdiction then we can’t say it’s not our problem and let the problem go elsewhere,” Deakin University security and terrorism expert Greg Barton said. Another key reason is to prevent would-be terrorists from going overseas, becoming highly trained and more radicalised, then returning as an even greater threat. “We had the experience with Afghanistan (in the late 1980s, early 1990s) that 30 Australians went and something like 24 of them, when they’d come back, went off to further extremism. So it was a radicalising experience,” Professor Barton said. Even if they don’t come back, there have been cases of people — like Melbourne man Neil Prakash — going overseas and using their clout and expertise to rally and radicalise people back in Australia. Prakash has been implicated in foiled Anzac Day terror plots in 2015 and 2016, despite leaving for Syria earlier. “Prakash was used quite effectively by Islamic State to phone back home people he knew, but also people they would put him in touch with,” Professor Barton said. “They built up his charisma and his profile, so that made him an effective tool for them. If they’re a threat, why not just arrest them instead? The problem (or solution, depending on your view) is the differing burdens of proof. “The threshold for passport suspension is lower than that for prosecuting for terrorism offences, as the grounds can be about anticipated future behaviour,” Australian National University’s director of national security policy, Jacinta Carroll, said. “In any terrorism case, investigators will be looking at the threat, the individual’s intentions and the tools available to counter the terrorist threat. Professor Barton said in some cases — particularly with younger people — cancelling passports can be enough to discourage their activities and may prevent further radicalisation. The power rests with Foreign Affairs Minister Marise Payne — not Home Affairs Minister Peter Dutton — but is based on the advice of a “competent authority”, like ASIO or the Australian Federal Police. Passports cancelled on terrorism grounds are often done at the request of Australia’s spy agency ASIO and comes after a security assessment by its director-general. At the last Senate Estimates in October, ASIO Director-General Duncan Lewis said that since 2012 more than 240 passports had been cancelled or refused in relation to the Syria/Iraq conflict. “By way of comparison, and to indicate the size of the threat, between 2001 and 2014 there were only about 40 passports cancelled on terrorism grounds,” Ms Carroll said. So the system works then? In December 2013 one of Australia’s most notorious terrorists, Khaled Sharrouf, used his brother’s passport to leave the country after his own had been cancelled. Ms Carroll also noted that while Australia could strengthen its processes, there was still an issue with coordinating an international approach to address the use of false passports and corruption at border checkpoints. “Many countries — particularly in our region — are making improvements in these areas, but good work by many can be undermined by corruption in a small number of transit points,” she said. And Professor Barton said recent events showed that even when passports are cancelled, the possibility of an attack doesn’t always go away. “The conundrum is that quite a few of the attacks and attempted attacks have been carried out by people who wished to travel and evidently were stopped from travelling. So that’s clearly a problem,” he said.